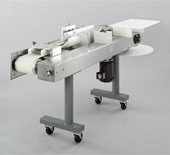 Bowl Lifter | KANTO KONGOKI INDUSTRIAL CO.,LTD. This bagel former forms ring shaped chunks from divided dough. This machine enables maximum 3,600 chunks per hour.